54″ Kensington Table shown in Rustic Cherry. 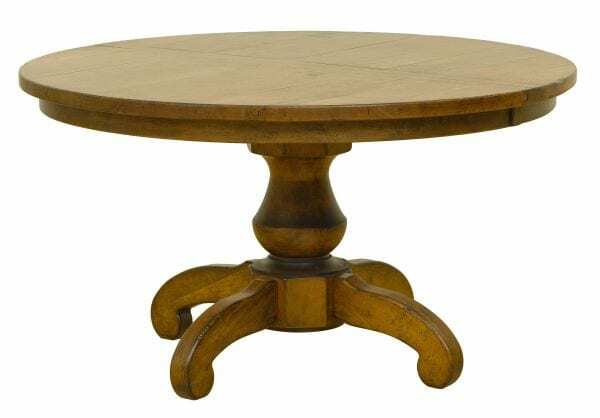 Standard Features: Round top, 1 1/2″ thick plank top, breadboard ends in center of table and on leaves (solid top tables will not have any breadboard ends), 18″ leaves, 2 1/4″ wide skirting, 1/4 round edge, double equalizer slides, Concord pedestal, Concord feet, distressed, low sheen finish. Available in sizes: 42″ round to 60″ round (6″ increments).